Write your own review on What Hi-Fi? and you could win a prize | What Hi-Fi? If you want to get something off your chest about a product you own, and help your fellow enthusiast with some extra information at the same time, you can do so on What Hi-Fi?. Anyone can write a user review on the site - you don't need to register on the site - and our favourite review each month will win an Audioquest Jitterbug. All reviews need to be on a product you own and please focus on the performance of the product and how well it meets your requirements and expectations. Ready to go? Find your product on What Hi-Fi? and then navigate to the user review tab. You can then - provided it's in our database - follow the simple process to enter a review. Once you've filled in the form and submitted your review it will go into our moderation queue. See below for more detailed instructions. Need some inspiration? 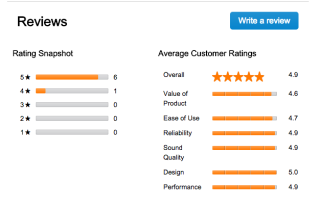 You can see a selection of previous user review winners here, here and here. It may take up to 48 hours for your review to appear on the site. However, you will receive an email confirming your review has been submitted.